Non-photoconvertible water-soluble chlorophyll-binding proteins, called Class II WSCPs, have been identified in some Brassicaceae plants. Although the WSCP in black mustard (Brassica nigra) was the second Class II WSCP to be reported by Murata and Murata, the cDNA has not been cloned until now. In this study, we cloned a cDNA encoding the black mustard WSCP (BmWSCP) and analyzed its chlorophyll binding affinity using its recombinantly expressed protein. Sequence analyses revealed that the mature region the BmWSCP cDNA was predicted to be 534 bp encoding a protein of 178 amino acid residues. Recombinant BmWSCP was expressed in Escherichia coli as a hexa-histidine fusion protein and could bind successfully to chlorophylls, with its highest affinity to Chl a, confirming that the cDNA encodes a Class IIA WSCP in black mustard. Almost all photosynthesis-related chlorophyll (Chl) binding proteins exhibit hydrophobic properties and are embedded in the thylakoid membrane of the chloroplast. By contrast, several Brassicaceae plants, e.g., Brassica oleracea, B. nigra, B. napus, Raphanus sativus and Lepidium virginicum possess water-soluble Chl-binding proteins (WSCPs) whose absorption spectra do not change with photoirradiation (Class II WSCP) [1,2]. These Class II WSCPs are further categorized in to two subclasses: Class IIA WSCPs possess higher affinity for Chl a, and Class IIB WSCPs exhibit higher affinity for Chl b . The physiological function of Class II WSCPs has been proposed as Chl scavenging in damaged cells [3,4]. Although the existence of a Class IIA WSCP in black mustard (BmWSCP) had been reported in very early during the history of WSCP research , its molecular cloning had not been performed until now. In this study, we cloned a cDNA encoding BmWSCP, and expressed it in Escherichia coli. Chl reconstitution experiments were conducted using thylakoid membrane prepared from spinach leaves. For cDNA cloning, we first made aligned the amino acid sequences of known Class IIA WSCPs and identified that LLLAAAVCT in the signal peptide region and GLRMFPFY in the C-terminal region are highly conserved . 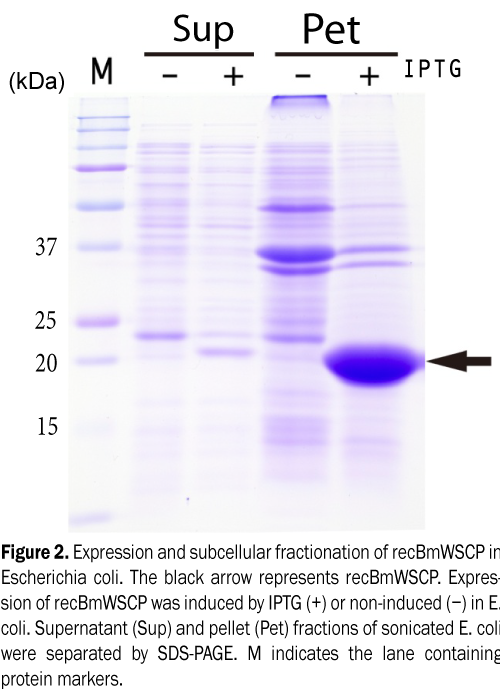 A BmWSCP cDNA was amplified using reverse transcription polymerase chain reaction (RT-PCR) using RNA isolated from the stem of B. nigra and degenerate oligonucleotide DNA primers deduced from the conserved amino acid sequences described above: 5'-TCTCCTKTTKGCTGCARCTRTYTGCACC-3' and 5'-CTAGTAGAATGGGAACATCCTYAGACC-3', respectively. The amplified fragments were cloned into pGEM T-easy plasmid vector (Promega) and the nucleotide sequence was determined. Class II WSCPs contain signal and C-terminal cleavage peptides . We excised the mature region of the BmWSCP cDNA by PCR using primer sets, 5'-CATATGAAAGAAGAGGTGAAGGACTCCAAC-3' and 5'-CTCGAGAGCATCATCATCAACCTTCACG-3', and cloned the fragment into pET-24a(+) (Novagen) for expression in E. coli. Sequence similarity analysis with the other Class II WSCPs indicated that the mature region of the BmWSCP cDNA was 534 bp encoding a protein of 178 amino acid residues. The nucleotide sequence of the mature region of the BmWSCP cDNA is shown in Figure 1. The sequence was deposited in DDBJ under accession number LC148656. The sequence identity of the deduced BmWSCP protein and the WSCP from cauliflower (Class IIA) was 89%, whereas comparison with the Class IIB WSCP from Virginia pepper weed (Lepidium virginicum) provided an identity of only 44%. Figure 1: Nucleotide and deduced amino acid sequence of the mature form of BmWSCP. The recombinant BmWSCP (recBmWSCP) was expressed in E. coli strain BL21-codon-plus and the cells were sonicated, and fractionated by centrifugation into soluble- and insoluble fractions. 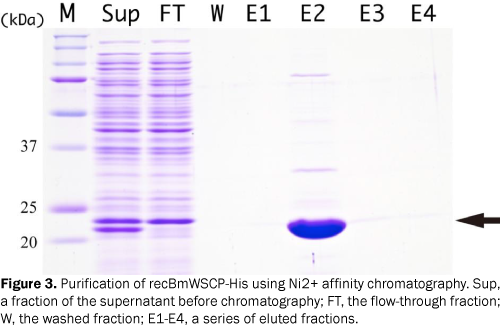 Figure 2 shows the subcellular fractionation of E. coli expressing recBmWSCP. The majority of the recBmWSCP was fractionated into the insoluble fraction; however, a significant portion of the recombinant protein was detected in the soluble fraction. Therefore, we purified the recBmWSCP from the soluble fraction using Ni2+-chelating affinity chromatography (Figure 3) according to a previously reported method . Figure 2: Expression and subcellular fractionation of recBmWSCP in Escherichia coli. The black arrow represents recBmWSCP. Expression of recBmWSCP was induced by IPTG (+) or non-induced (−) in E. coli. Supernatant (Sup) and pellet (Pet) fractions of sonicated E. coli were separated by SDS-PAGE. M indicates the lane containing protein markers. Figure 3: Purification of recBmWSCP-His using Ni2+ affinity chromatography. Sup, a fraction of the supernatant before chromatography; FT, the flow-through fraction; W, the washed fraction; E1-E4, a series of eluted fractions. WSCPs analyzed to date have been are highly hydrophilic and can remove Chl molecules from thylakoid membranes in aqueous solution [3-7]. A method for the purification of thylakoid membranes from spinach leaves and Chl reconstitution with WSCP has been described previously [3,7]. Briefly, we mixed the recBmWSCP with the isolated thylakoid membrane fraction. After centrifugation, the absorption spectrum of the supernatant was measured (Figure 4). The spectrum showed a typical absorption spectrum of Class IIA WSCPs, which are characteristic of a WSCP preferentially bound to Chl a. 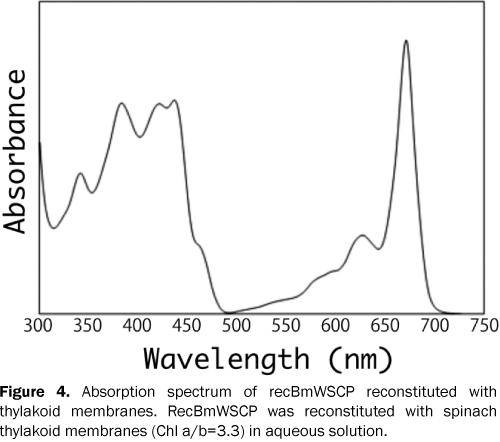 The peak wavelength of 671 nm in the red band of the reconstituted recBmWSCP was slightly shorter than that purified from black mustard plant, i.e., 673 nm . This difference might be due to the difference of substrate thylakoid membrane, or due to heterogeneity of WSCP gene in black mustard genome. Figure 4: Absorption spectrum of recBmWSCP reconstituted with thylakoid membranes. RecBmWSCP was reconstituted with spinach thylakoid membranes (Chl a/b=3.3) in aqueous solution. Thus, 45 years after the discovery of a WSCP in B. nigra, we cloned the cDNA and produced its functional recombinant protein for future analysis. Murata T and Murata N. Water-soluble chlorophyll-proteinsfromBrassica nigra and Lepidiumvirginicum. Carnegie Inst WashYearbook. 1971;70:504-507. Satoh H, et al. Water-soluble chlorophyllprotein in Brassicaceaeplantsis a stress-inducedchlorophyll-bindingprotein. PlantCell Physiol. 2001;42:906-911. Takahashi S, et al. Molecular cloning, characterization and analysis of theintracellularlocalization of a water-soluble Chl-bindingproteinfromBrusselssprouts (Brassicaoleraceavar. gemmifera). Plant and CellPhysiology. 2012:53,879-891. Takahashi S, et al. Molecular cloning, characterization and analysis of theintracellularlocalization of a water-soluble chlorophyll-bindingprotein (WSCP) from Virginia pepperweed (Lepidiumvirginicum), a unique WSCP thatpreferentiallybindschlorophyll b in vitro. Planta 2013:238,1065-1080. Takahashi S, et al. The C-terminal extensionpeptide of non-photoconvertiblewater-soluble chlorophyll-bindingproteins (Class II WSCPs) affectstheirsolubility and stability: comparativeanalyses of thebiochemical and chlorophyll-bindingproperties of recombinantBrassica, Raphanus and LepidiumWSCPs with orwithouttheir C-terminal extensionpeptides. Protein J. 2014;33,75-84. Takahashi S, et al. Molecular cloning and functionalexpression of a water-soluble chlorophyll-bindingproteinfromJapanese wild radish. J Plant Physiol. 2013;170,406-412. Satoh H, et al. Molecular cloning and functionalexpression of a water-soluble chlorophyllprotein, a putativecarrier of chlorophyllmolecules in cauliflower. J Biol Chem 1998;273:30568-30575.